Hi friends! So after years of using paper planners, I’m trying out bullet journals! I had avoided bullet journals because it seems like most days I can barely fill in the already drawn out calendars and what not. But, I’ve been seeing so many creative ideas on Pinterest that I got curious. So to start, I added a simple title page. 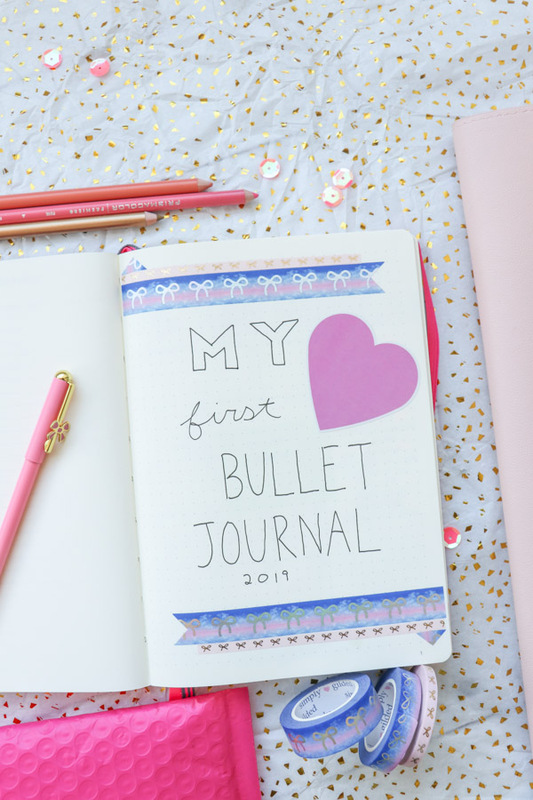 And today, I’m sharing that super EASY Bullet Journal Title Page idea for my first bullet journal. Maybe you’ll want to use something similar in yours!? Note: This post contains affiliate links. If you make a purchase from one of these links, I may make a small commission at no extra charge to you. Please do reach out if you have any questions. So this Easy Bullet Journal Title Page Idea is basically a bullet journal idea for people who can’t draw. As you can see from the photos, all the art and colors come from beautiful washi tapes with the help of a giant heart sticker. I did use a mix of font styles, but psst – that’s how you make it look more artistic (still) without drawing. Look at it. Those fonts are not special, and the ink color isn’t either. They’re just a bunch of straight and curved lines, really. Which means you can do it – no art experience required! No calligraphy or brush lettering skills required, guys! And want to hear a secret? I had originally intended for the text to be center-aligned. But I messed it up! So you know what, work with your mistakes. When I saw the second line was off already, I made the rest of the lines purposefully off-center. And it ended up leaving a big space in the upper right area. Which is why I added the sticker. And funnily enough, it kinda looks like I did it on purpose. But now you know the truth. Haha! 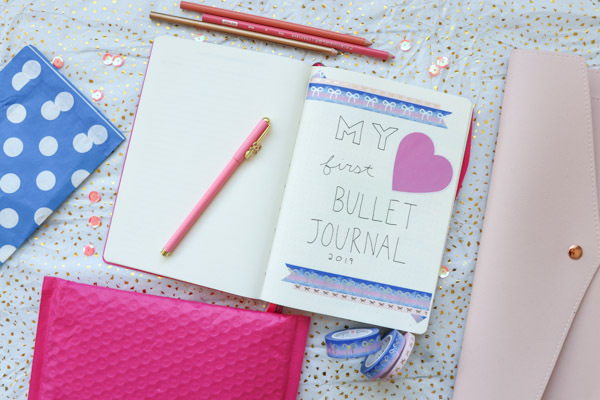 Next up – we add color, style, and fun to our Easy Bullet Journal Title Page Idea with washi tape and stickers. Okay, just one big sticker. The key is using a consistent color theme. As I’d just decided to crack open my PlannerCon goodie bag stash, I opted to use this beautiful PlannerCon-exclusive washi tape by Simply Gilded, along with a thin pink bow washi tape (also by Simply Gilded). So the theme is this ombre blue and light-purple-ish pink color scheme. And the pink skinny washi worked well here, as did the heart sticker. To make the washi tape not just slammed down on the paper, I cut little triangles out of the edges on one side. I think this makes it look a little more special with very little effort from you. And since I can’t bear to waste washi tape, I added the little triangles on the outer (top/bottom) edges of the washi strips. So that’s it! Easy, right? And you can easily adjust the layout to use your own preferred writing style, washi tape theme, and stickers to your personal liking. Customizable. Woop! Since this is my first bullet journal post, I don’t have any bullet journal links to share yet. But don’t worry! I’ve taken some fun photos this weekend, which means they’re on the way. For now, here are some general planner ideas. 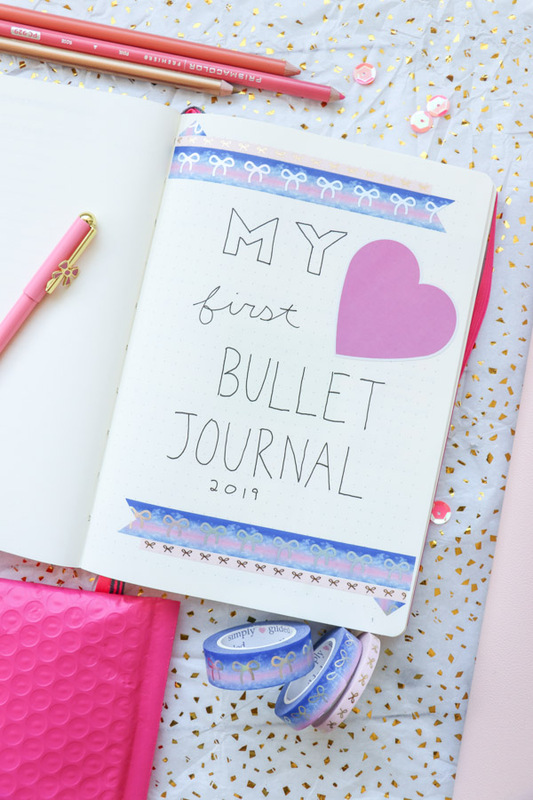 Thank you so much for reading and checking out my Easy Bullet Journal Title Page Idea: My First Bullet Journal. Hope you enjoyed it. Happy planning!